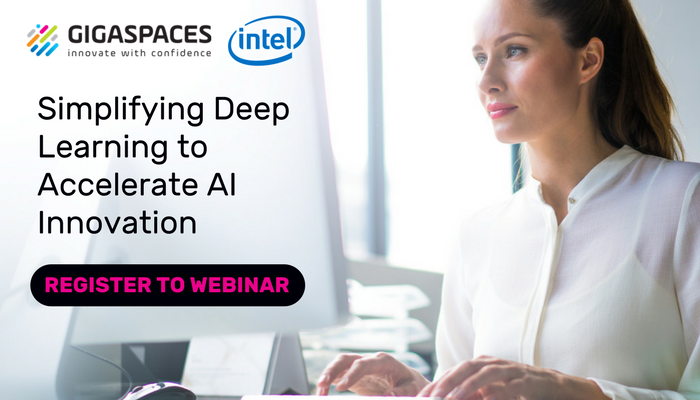 Following our successful September announcement about our collaboration with Intel to simplify artificial intelligence (AI) through an integration between GigaSpaces’ InsightEdge platform and Intel’s BigDL open source deep learning library for Apache Spark, Intel has announced it will host a joint webinar with GigaSpaces on Simplifying Deep Learning to Accelerate AI Innovation. The webinar will take place on December 13th. Presenters: Jason Nerothin, Senior Technical Account Manager at GigaSpaces and Radhika Rangarajan, Engineering Director, Intel. The recording will be made available on demand. BigDL is a distributed deep learning library for Apache Spark. You can learn more about deep learning and neural networks on Coursera. With BigDL it’s possible to write deep learning applications as standard Spark programs thus allowing to leverage Spark during model training, prediction, and tuning. High performance and throughput is achieved with Intel Math Kernel Library. Read more about BigDL here. Adoption of AI innovations like deep learning is growing rapidly across industries such as financial services, healthcare, transportation, and retail; where GigaSpaces has a strong track record in delivering high performance solutions. In addition, the company has expanded its analytics portfolio over the past year to incorporate full-stack analytics (SQL, streaming, machine learning) through Apache Spark. The BigDL and AI portfolio provide an infrastructure-optimized solution for deep learning workloads leveraging Intel® Xeon® Scalable processors. Together the technologies fill a critical market gap by creating an intelligent insight platform that makes it easy to innovate on real-time advanced analytics applications with low risk and TCO. Cost savings: BigDL eliminates the need for a dense specialized hardware for deep learning, meaning low cost compute infrastructure using Intel Xeon Scalable processors that can train and run large-scale deep learning workloads without relying on GPUs. Simplicity: Deep learning scenarios are complex and require advanced and complex training workflows. InsightEdge’s simplified analytics stack, leveraging BigDL and Apache Spark (open source and widely adopted) eliminates cluster and component sprawl complexity; radically minimizing the amount of moving parts, while capitalizing on existing Spark competency. Scalability: The integration allows organizations to innovate on text mining, image recognition, and advanced predictive analytics workflows from a handful of machines to thousands of nodes in the cloud or on-premises, using the same application assets and deployment lifecycle. Harnessing the business value of artificial intelligence is often challenged by the lack of mature compute infrastructure and technology complexity, leading to inefficiency and slower time-to-analytics. GigaSpaces’ integration with BigDL helps enterprises deploy, manage, and optimize a simplified and comprehensive AI technology stack for automated intelligence without the need for expensive, specialized hardware or complex big data solutions. Register Now for this Intel and GigaSpaces Data Analytics Webinar.